Men's half-marathon winner Michael Laforest of Missoula crosses the finish line with a time of 1:15. 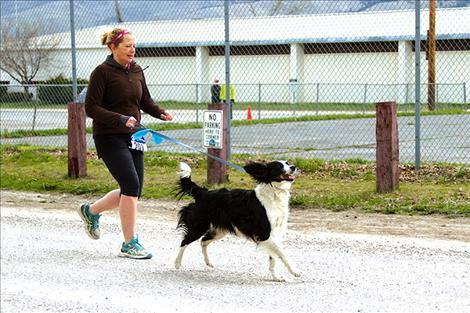 Kathryn McEnery, of Hot Springs, and her furry companion set out on a half-marathon adventure. Runners are all smiles at the start of the 5K/10K. Mile fun-run winner Cody Katzer (138) takes a moment for a post-race picture with brothers Waylon Katzer (139) and Cash Katzer (140). 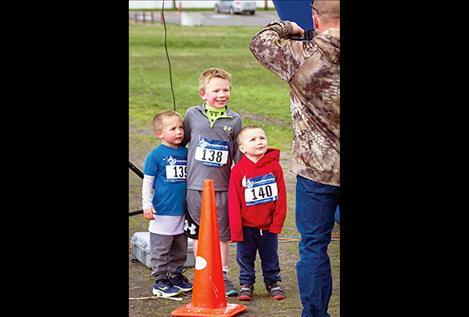 About 300 runners gathered under cloudy skies on Saturday morning to stretch their legs and kick off the spring season in Arlee during the Buttercup run. The popular event is held each year to benefit the Friends of Arlee School, a non-profit group that provides mini-grants to teachers and awards scholarships to graduating Arlee High School seniors. According to their website, the Friends of Arlee School has given over $140,000 in scholarships and mini-grants to the Arlee schools. 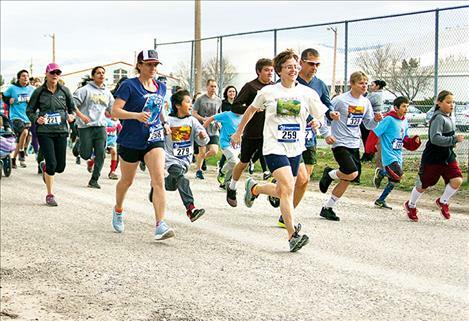 A one-mile fun run, 5K run/walk, 10k run/walk and half marathon, which travelled along several local roads including Pow Wow Road and Jocko Road, began and ended at the Arlee High School. The courses challenged novice runners and seasoned veterans alike. 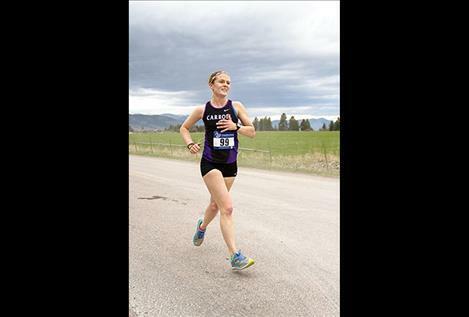 For the second year in a row Jaine Reid, of Helena, was the top female half marathon runner with a time of 1:28:54.08. The man with the top time for the half marathon was Michael Laforest, of Missoula, who finished with a time of 1:15:16.05. The first woman to cross the 10K finish line was Casey Mann of Florence, who finished in 32 minutes and 37.43 seconds. 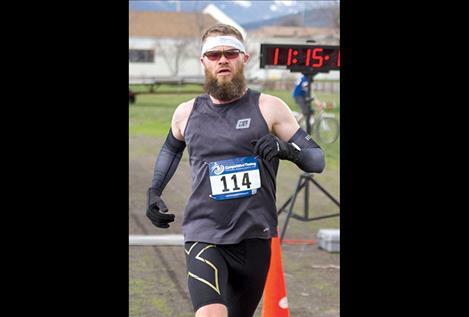 Arlee resident Colt Crawford was the top male 10K runner, with a time of 42 minutes and 4.79 seconds. Douglas Robinson, of Missoula, and Sarah Beck Smith, of Polson, was the top 10K walk finishers with overall times of 1:13:25.35 and 1:28:13.52. The top female 5K runner was Cynthia Arnold, of Polson, who finished in 22 minutes and 48.45 seconds. Louis Brenner, of Polson, crossed the 5K finish line first for the men with a time of 22 minutes and 48.44 seconds. Top one-mile fun run winners are Cody Katzer, of Libby, posting a time of 8 minutes and 7.54 seconds and Destiny Hadley, of Arlee, with a time of 8 minutes and 57.11 seconds.